No doubt, you'll be pleased to know that all it will take to look up-to-the-minute chic this winter is--thankfully!--a pair of high-waisted cropped jeans, a fantastically cozy sweater and feminine mid-heel pumps. Fashion show go-ers worked this new cold-weather uniform aplenty in London and Paris, relishing, no doubt, its comfort factor, too. To get in on this easy, breezy look, consider these jeans by Madewell (I have and adore them! ), MiH, and Alexa Chung x AG, along with these standout knits from J.O.A., River Island, BCBG, Stella McCartney, Joseph, Vanessa Bruno and No. 21 (my friend wore this to meet for drinks in Paris and it is truly awesome!). Shoe-wise, I love these by Chloe, Topshop, Nine West and Jeffrey Campbell (inspired by the Chanel pumps in the last two pictures!). Thanks ! 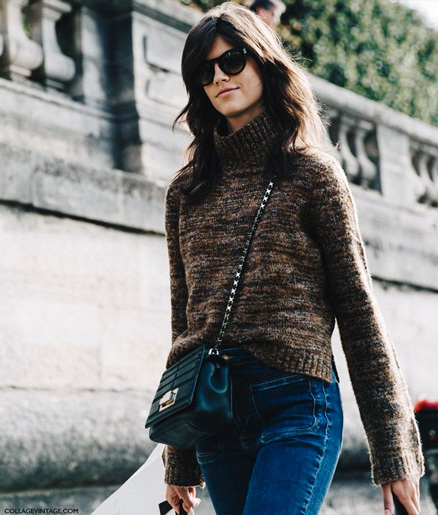 Love the half-tuck look with the sweater! Top photo - who makes the black crossbody bag? Any idea who makes the sweater or jeans in the first photo?